From welcoming new faces to celebrating old friends, heralding conservation milestones and leading veterinary breakthroughs, it’s been a year to remember. We take a look at some of our favorite stories from 2014—those that touched our hearts, made us smile, and made a positive impact on the world we share. Here’s to a wild 2015! We’ve watched grizzly bear brothers Keema and Denali grow up at Woodland Park Zoo, transforming from cautious little cubs to kings of the Northern Trail. When the pair turned 20 last January, they…slept right through it. Winter is a time of little activity for bears, after all. But as they stirred from their winter slumber, we surprised them with a belated birthday blast in April, complete with mounds of snow trucked in by our good friends at Crystal Mountain Resort. Hidden throughout the snow were favorite treats from meaty knuckle bones and fish, to peanut butter and marshmallow fluff. 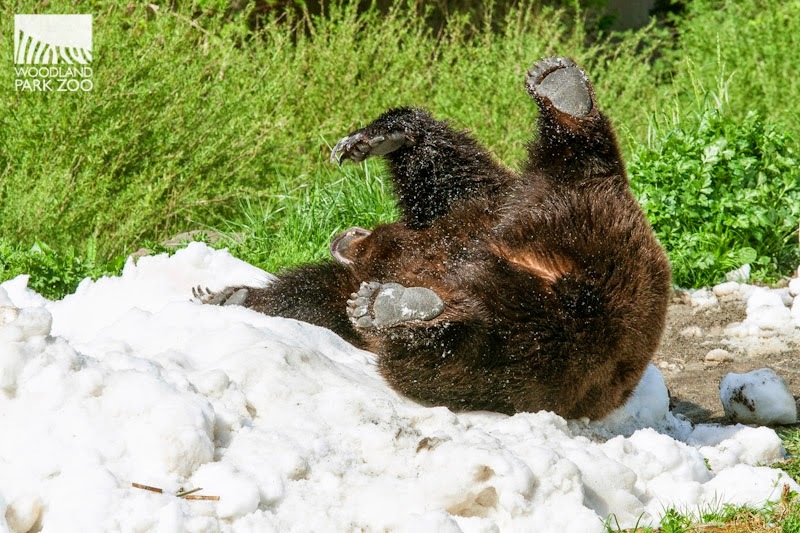 It was a joy to see the bears smash and crash their way through the fun, and make their own versions of snow angels. Herpetology is cool, man. With Teenage Mutant Ninja Turtles back on the big screen, it was a great year to turn the spotlight on reptiles and amphibians. On the local front, the Northwest native Oregon spotted frog had a big year, gaining federal protection from the Endangered Species Act and getting a boost in population from headstarting efforts at Woodland Park Zoo and partners. We celebrated the comeback of turtle #23—a native western pond turtle raised at Woodland Park Zoo who was too small for wild release last year but overcame all obstacles to make it to the big leagues this year! And the support for native wildlife continues thanks to the good work of citizen scientists who are helping us map amphibian populations in our local parks and wildlife areas. Coming at conservation from all fronts—including federal, state and community levels—is bringing hope to the cause. 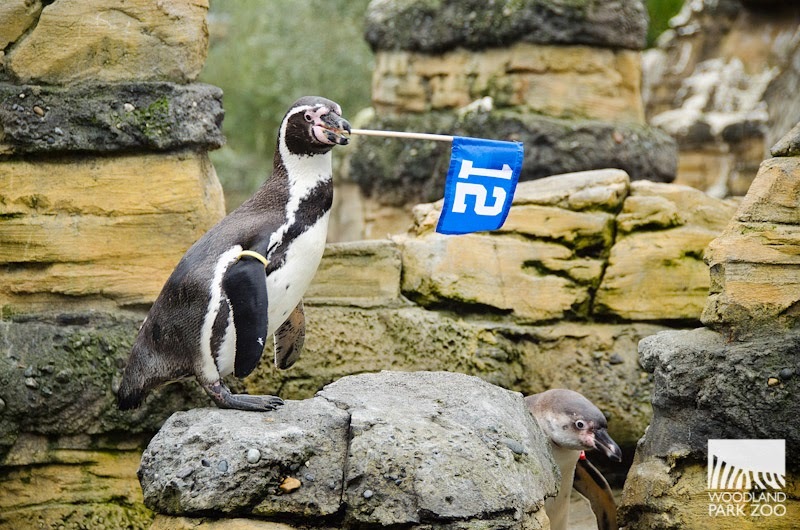 The animals helped us cheer the Seahawks on all the way to the Super Bowl this year. Our own Zooper Bowl enrichment showed us how penguins rush—let’s call it Beak Mode. The four male Asian small-clawed otter pups born in 2013 earned their Legion of Boom names—Sherman, Thomas, Chancellor and Maxwell—thanks to their great defense in their exhibit, blocking crows left and right. The fun continued through the big game thanks to a friendly wager with our good buddies at Denver Zoo. As the losing city, Denver sent a case of trout to our sea eagles—what a delicious victory! 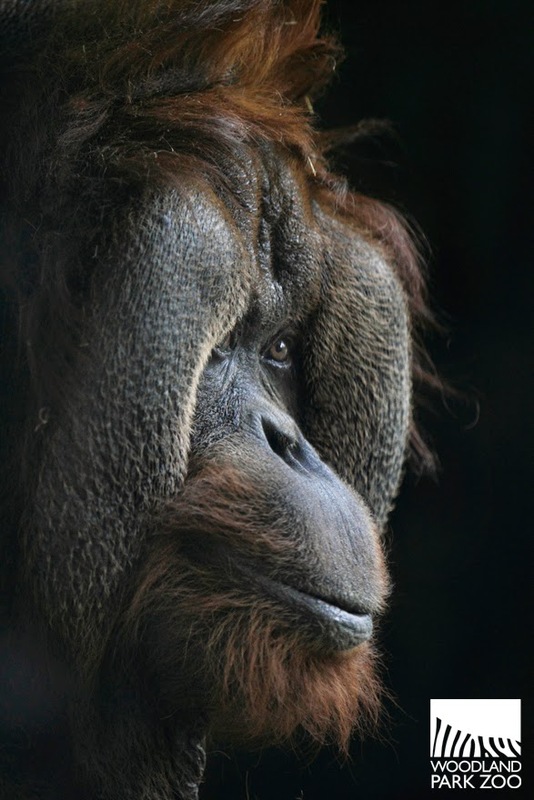 Portrait of Towan by Dennis Dow/Woodland Park Zoo. If you saw the most recent Planet of the Apes film, the character of Maurice the orangutan may have seemed familiar to you. 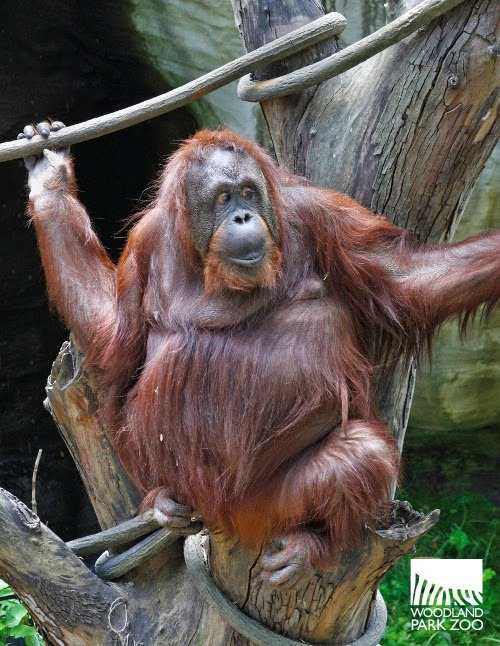 That’s because the actor behind the motion-capture performance, Karin Konoval, found her inspiration for the character from studying the personality and physicality of Towan, Woodland Park Zoo’s oldest male orangutan. "I sat down at a window to watch Towan—he was about ten feet away from me with a burlap blanket over his head. Every once in a while a corner of the blanket would poke up and he'd peek at me. Then suddenly: he tossed off the blanket and leapt to the window to press his face to mine. For twenty minutes his eyes studied up and down my face. And in that time, somehow, Towan gave me the magic key to Maurice. I can't explain it better than that. Whatever he gave me was far richer than I could describe in words." Our Humboldt penguins are a prolific bunch. Since 2010—the first breeding season in their new exhibit—our colony has produced 41 chicks! Earlier in the season, we were counting up eggs (yes, before they hatched) and got excited when we realized we were going to reach an historic 40th hatching. And though we love our round numbers, we won’t complain that one more egg was laid and number 41 came along at the end of May. Each hatching we have celebrated at Woodland Park Zoo represents the next generation of conservation ambassadors! 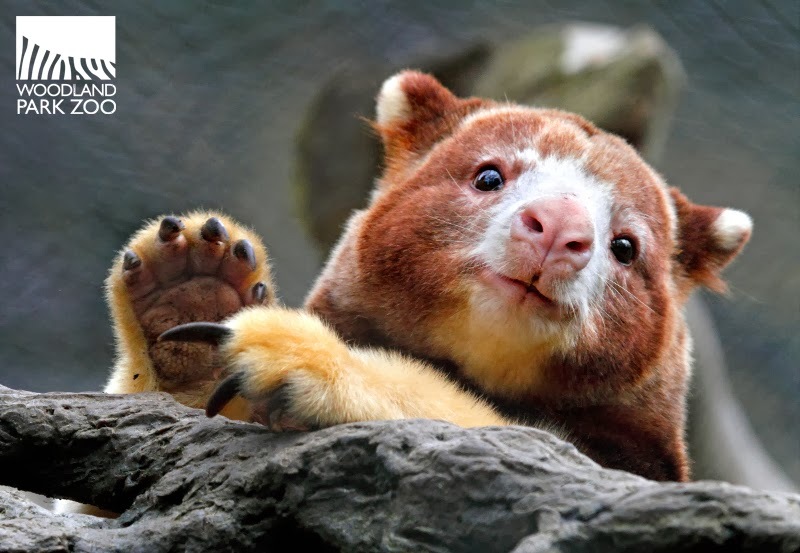 What a year for Woodland Park Zoo’s flagship conservation program: the Tree Kangaroo Conservation Program (TKCP). After taking home a prestigious United Nations Equator Prize this summer, the program was again honored in the fall by the Association of Zoos and Aquariums with its International Conservation Award. Awards are nice, but what’s even more special is what they represent—the leadership role TKCP is playing in setting international standards for excellence when it comes to conservation solutions that work for people and wildlife alike. Every time you visit the zoo, you make this work possible. Thank you! We had the joy of watching the Asian small-clawed otter family grow again this year—with four more pups born in January, turning last year’s pups into this year’s big brothers! The closely bonded family of 10 lives together and even the brothers play a role in raising the littlest ones. The heart of the zoo is alive with the chirps and squeaks of the otters who spend much of their day eating, nesting and playing together. Nina portrait by Mat Hayward/Woodland Park Zoo. We welcomed new members of the zoo family this year—from lion Xerxes who’s now a first time dad, to Dave the giraffe who became little Misawa’s favorite friend! Our newest addition, Yukiko, only just arrived, and this male red panda has great potential to be a successful mate to our female. They were matched up through the Species Survival Plan conservation program and we hope they’ll hit it off! 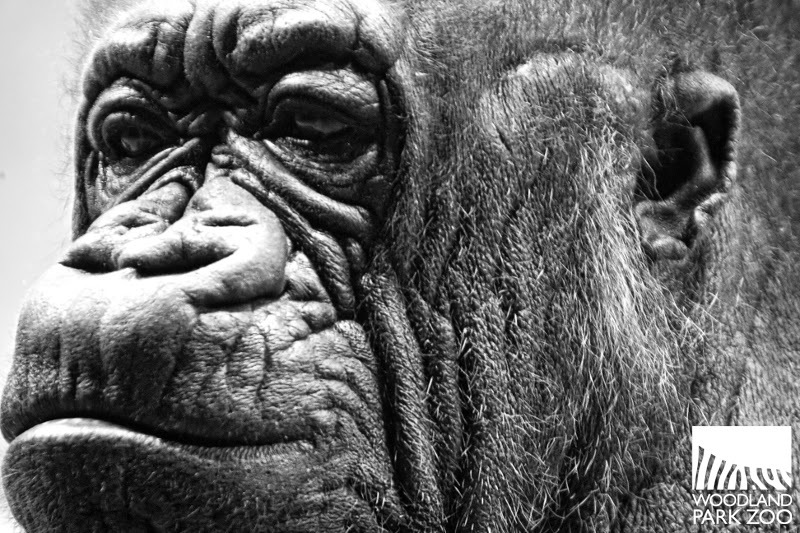 As exciting as it is to celebrate the new arrivals, this year we also enjoyed taking a closer look at the thoughtful care that goes into looking after the geriatric animals, like old-timers Pete and Nina, the bedrocks of our gorilla program. Photo by Julie Larsen Maher/Wildlife Conservation Society. This was a year of great change over at the Elephant Forest exhibit, with the loss of Watoto, our beloved African elephant, and the announcement that we will phase out our on-site elephant program. Throughout this hard news was one constant—our commitment to saving elephants in the wild, and your dedication to joining us in making a difference. When we launched our 96 Elephants campaign this year to gather voices in support of ending the ivory trade in Washington state, we were blown away by the response. Along with our friends at Point Defiance Zoo and Aquarium and their community, more than 5,000 of you pledged your name to the cause and the herd was heard. We sent your names to elected officials and drew attention to the local movement that strengthens our international efforts on the conservation frontlines in Africa and Asia. And we’re making strides! Because of your hard work, Governor Inslee proclaimed September 22 as World Elephant Day in Washington state and several legislators are now considering sponsoring legislation. Thank you! You know what they say: once a cheetah, always a cheetah. And while cheetahs Liz and Missy, who joined us for a temporary summer exhibit this year, have since returned to their long-term home at Wildlife Safari in Oregon, we can’t help but always have a place for them in our hearts. We put the spotlight on these dotted denizens this summer, and they helped us tell the story of the work that happens at zoos and in the field to protect vulnerable and endangered species. Video: Baby porcupette chews on stick. 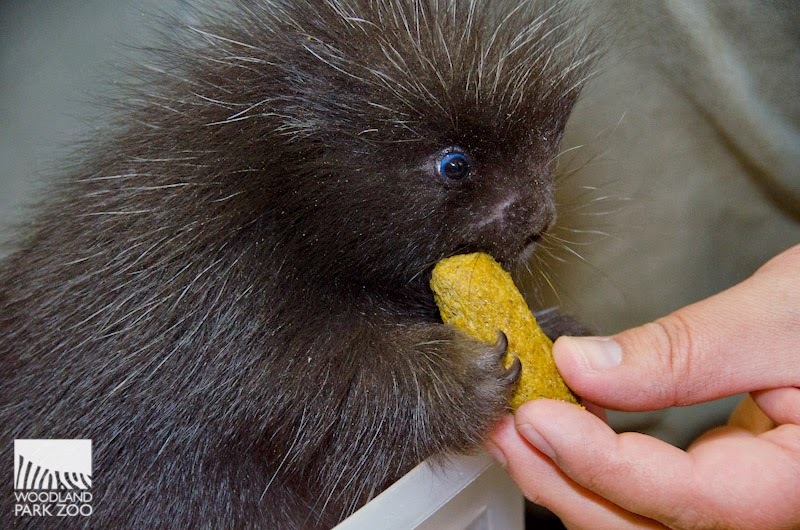 Porcupine babies, known as porcupettes (seriously), are born with a soft coat of quills that begins to harden within hours of birth. This immediately protects them from predators...and thick gloves immediately protect us from them! Porcupine Marty currently lives off-exhibit at the Raptor Center. There she works one-on-one with her keepers who are training her for future appearances in raptor and education programs. Her training is coming along well—she is learning to go to her station and into her crate, as well as how to climb a ramp on command. It’s a little challenging for keepers to find a good time for training sessions with Marty, as she is nocturnal by nature, but the progress so far is promising! Lion-tailed macaque Sita received successful cataract surgery this year. Photo by Andy Antilla/Woodland Park Zoo. When Woodland Park Zoo helped host the annual Zoobiquity conference this year, which brings together human health, environmental health and animal health experts to find common lessons and shared insights, it seemed a fitting cap to a year in which we successfully treated a number of zoo animals for ailments that are all too familiar to many of us—from cataracts in a macaque, to allergies in a donkey; soreness for a goat and sinus problems for a silverback. Our veterinary team works closely with animal and human health experts throughout the community to find solutions and treatments that stem from our common animal biology. Our conservation partners around the globe gave us reasons for hope with stories of hard work, hard truths, and hard won successes from the field. We learned of orangutans rescued in Indonesia thanks to the help of our Partner for Wildlife, Gunung Palung Orangutan Conservation Program. We saw tremendous progress by Madagascar locals in a project we support where critically endangered frogs found nowhere else in the world are being reared in local facilities to safeguard against extinction. 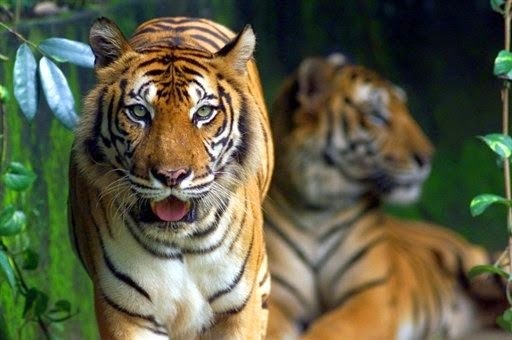 Since establishing a 10-year, $1 million partnership with Panthera to assist our Malaysian colleagues’ efforts to save tigers from extinction, reports are coming in from the frontline. To get a handle on the site’s tiger population, the team is conducting a camera trapping project. This summer, they installed 95 camera trap stations across a 147,000 acre (600 km2) grid, where automatic cameras detect and capture the motion and body heat of tigers passing by, day or night. After 60 days, researchers downloaded and analyzed photographs of tigers’ individual stripe patterns to estimate the grid’s population and to determine tiger hotspots. Where there are tigers, there is hope. Photo by Darin Collins/Woodland Park Zoo. With her previous litter maturing and heading off to new homes to start their own families someday, Adia was ready to be a mom again. Her new mate, Xerxes, arrived from El Paso Zoo and the two hit it off immediately. Paired up through the Species Survival Plan conservation program, Xerxes and Adia didn’t take long to bring another litter to Woodland Park Zoo—this time three boys born in October. The cubs are thriving behind the scenes with mom, and we have high hopes that the family will soon live together as one big pride! We can’t wait to see what 2015 brings for them. What were your favorite zoo memories this year? Fantasizing about hibernating during the hustle and bustle of the holiday season? Many of us wish we could find a cozy den, curl up and peace out until spring, but there are ways to cope! Here are a few insider tips from the residents of the Northern Trail, our winter experts. Wolves on the Northern Trail. Photo by Kirsten Pisto, Woodland Park Zoo. North American river otters know that saving precious energy during cold spells in not only smart, it can be a lot of fun! These playful winter experts use ice to slide to wherever they need to go. They might look like they are just having a blast, but they are conserving calories while they’re at it. We highly recommend sledding, but we aren’t sure it will save energy, so bring a snack if you plan to replicate this adaptation. 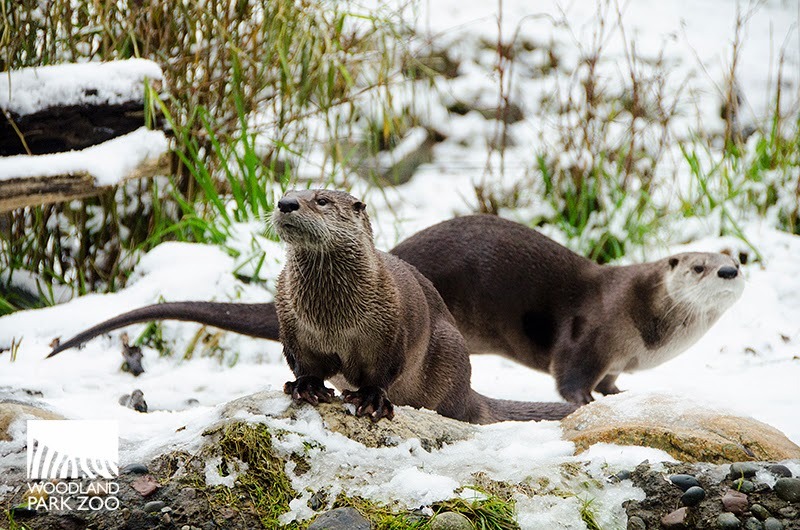 North American river otters. Photo by Ryan Hawk, Woodland Park Zoo. You aren’t going to get very far if you are stuck in the snow. 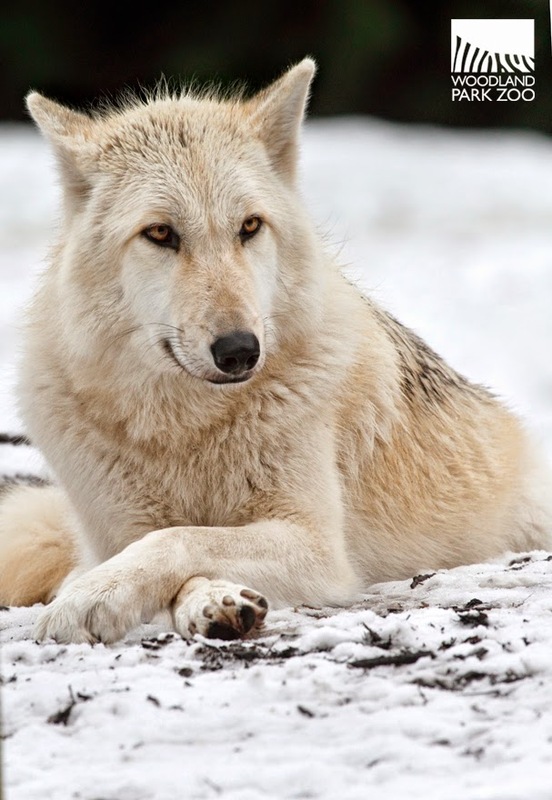 Our wolves are equipped with humungous paws with fleshy pads and claws that can spread out to provide traction in snow and ice. They also eat a LOT of food to keep energy levels high enough to power through heavy snow. Snowshoes or ice grips are the closest people will get to replicate this cool adaptation. Photo by Dennis Dow, Woodland Park Zoo. Snowy owls are perfectly suited to blend into the chilly landscape. Their light coloration allows them to disappear among the snow tufted trees which gives them the advantage when it comes to hunting small prey. On the flip side, their camouflage also helps them to avoid predators, such as Arctic foxes. When it comes to Seattleites, your best bet for blending in this winter is a beard, a fleece and a tattoo of a snowy owl. 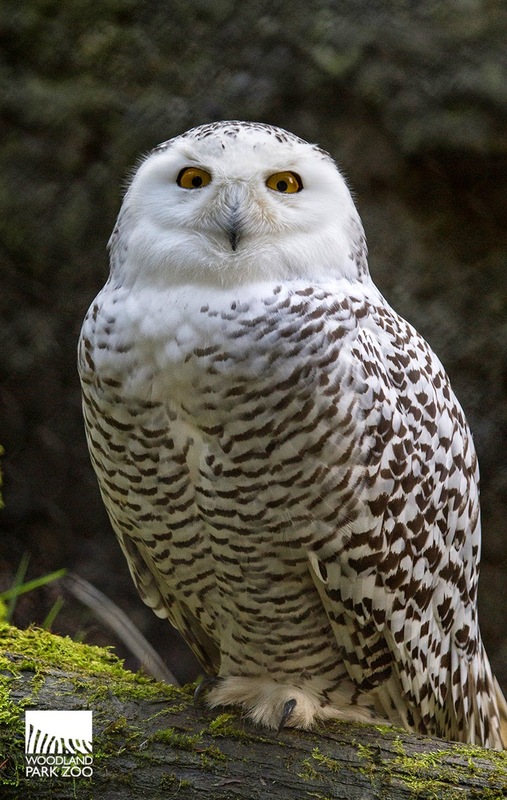 Snowy owl, photo by Dennis Dow, Woodland Park Zoo. 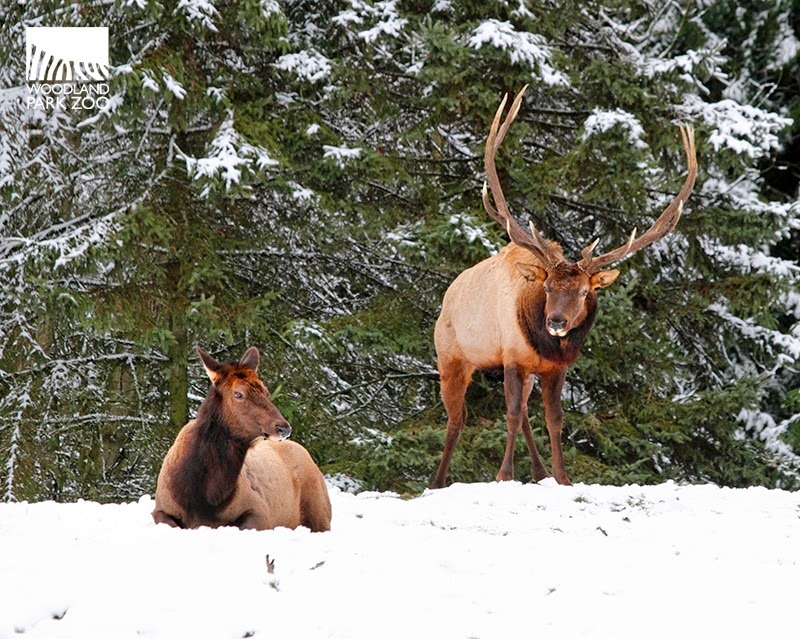 Elk grow a special winter coat which is much thicker than their summer coat. The fur grows in two layers, one is a woolly undercoat which helps insulate the elk, and the outer coat is made up of tougher guard hairs which protect the elk while they forage through the trees. While you may be hard pressed to grow a woolly undercoat, wearing layers is a good start! Elk on the Northern Trail. Photo by Dennis Dow. Grizzlies, like most mammals, are not true hibernators, but are what we call light hibernators, since they can and do wake up and move about during their winter naps. However, a grizzly bear’s heart rate and breathing can become quite slow during dormancy. This one is easy, take it from our grizzly bears and use this month to catch up on your Z’s. Just like a bear, your circadian rhythm responds to your environment’s light (or darkness). In the Pacific Northwest (with sunsets around 4:00 p.m.!) your body will naturally tend to slow down as it gets darker and colder. 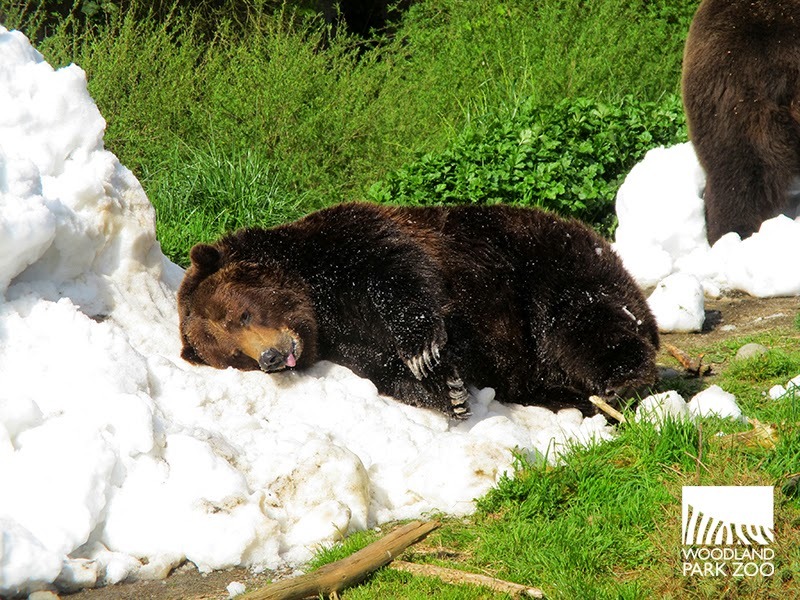 A Grizzly bear and his snow nap. Photo by Kirsten Pisto, Woodland Park Zoo. Zoo photographers have adapted to sitting in the snow for hours at a time. Their ability to remain dexterous in freezing conditions helps them to capture their subjects in the midst of snow, sleet or rain… or something like that. Our photog’s winter tip? Get plenty of hot cocoa before, during and after a snowy shoot. The chocolate keeps your shutter fingers nimble. 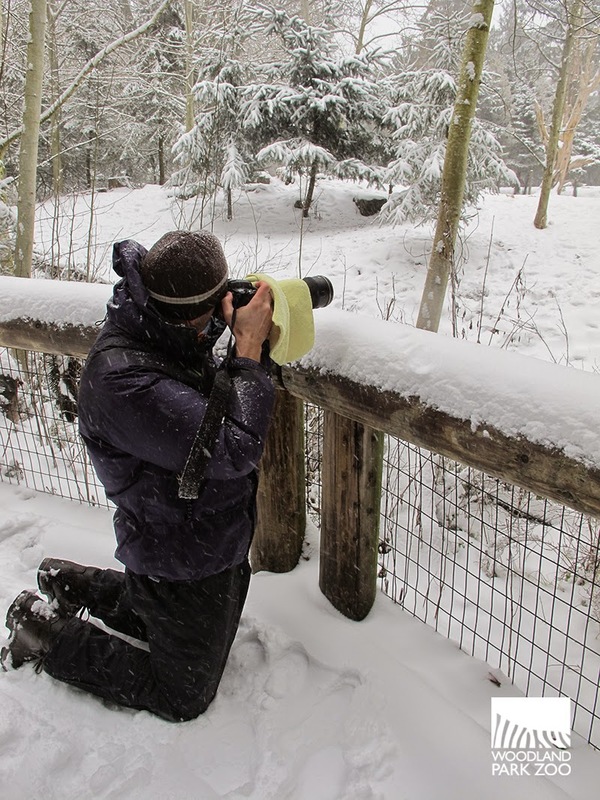 Zoo photographer, Ryan Hawk is adapted to the chilliest conditions. Photo by Kirsten Pisto, Woodland Park Zoo. 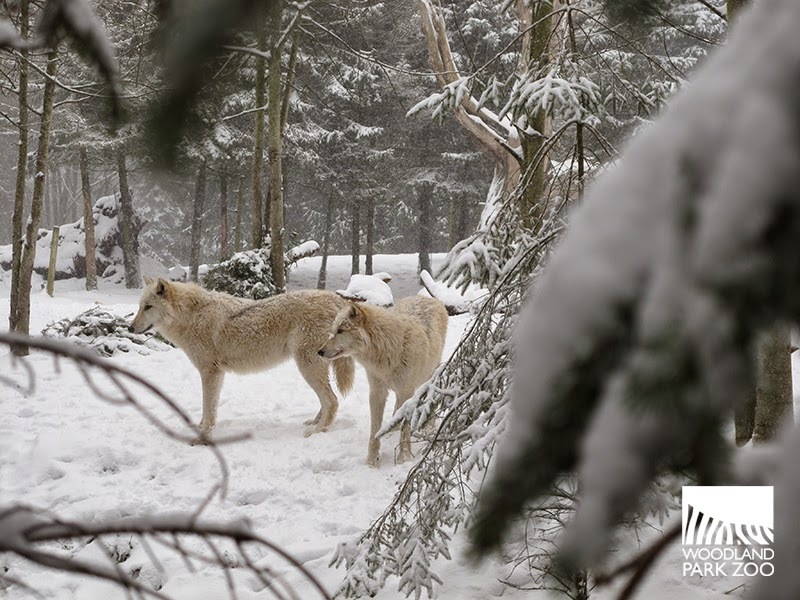 Stay cozy and remember to visit Woodland Park Zoo for Winter Celebration this weekend! We’ve got a new arrival to the Temperate Forest… he’s got a fiery red coat and his name is Yukiko! As part of Woodland Park Zoo’s preventive care program, our veterinary team performed a full physical examination of Yukiko including his weight, blood work and radiographs. “We are pleased overall with his weight and blood work and he appears to be in good shape,” said Dr. Darin Collins, director of Woodland Park Zoo’s Animal Health Programs. Photo by Ryan Hawk, Woodland Park Zoo. Yukiko during his preventative exam. Photo by Ryan Hawk, Woodland Park Zoo. Dr. Darin Collins checks out Yukiko's teeth and gums. Photo by Ryan Hawk, Woodland Park Zoo. The 9-year-old panda arrived under the Red Panda Species Survival Plan conservation breeding program from Red River Zoo in Fargo, N.D. Yukiko will be paired up with our female, 7-year-old Stellar, in the hopes that they hit it off. The breeding season for red pandas occurs from early January to early March so Yukiko will remain off exhibit as he goes through a series of introductions to Stellar. The introductions will take place in off-view dens and both animals will remain off view until April. There is currently no test available to determine pregnancy in a red panda. However, ultrasound and behavioral changes can help indicate a pregnancy. 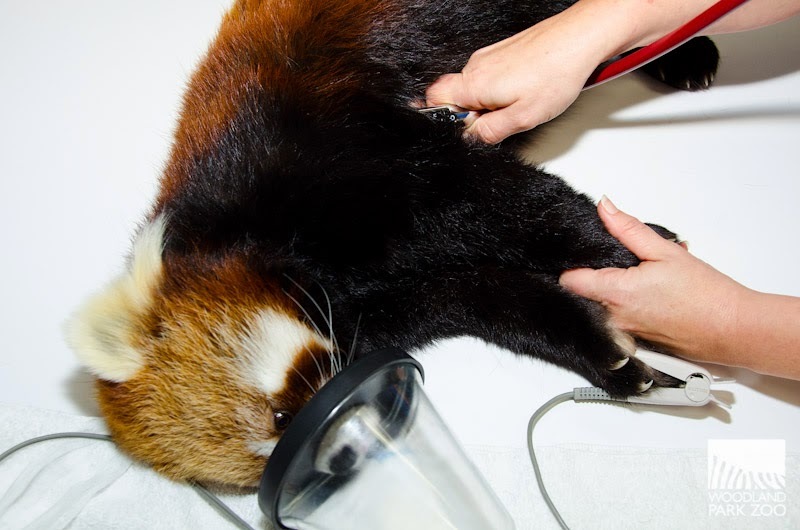 “Thanks to the dedication and innovation of our red panda keepers, Stellar has been successfully trained for ultrasound procedures. 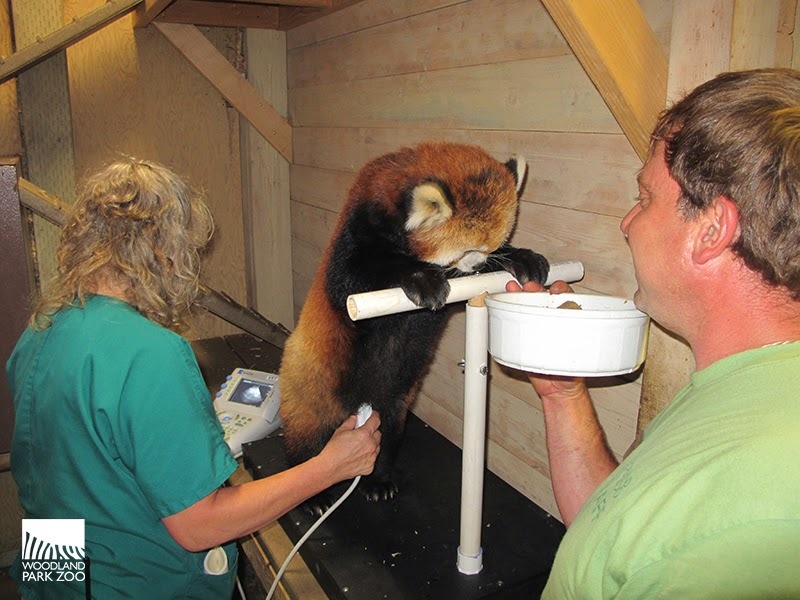 “During ultrasounds, Stellar perches on a T-stand, made by our lead panda keeper, and is treated to a bowl of blueberries and leaf-eater biscuits soaked in apple juice. Her willingness to cooperate will help us monitor her pregnancy,” explains curator Mark Myers. Stellar practices her blueberry munching with help from keeper John Samaras while vet tech Barb Brush performs a test ultrasound. Photo by Kirsten Pisto, Woodland Park Zoo. Stellar really likes blueberries! She knows just what to do with the T-stand. Photo by Kirsten Pisto, Woodland Park Zoo. Red pandas share the name of giant pandas, but more closely resemble raccoons. While scientists still debate which family red pandas belong to, raccoons or giant pandas, recent studies suggest that they are equally related to three different groups of animals that include skunks, weasels and raccoons! In the wild, fewer than 10,000 red pandas remain in their native habitat of bamboo forests in China, the Himalayas and Myanmar, and share part of their range with giant pandas. Their numbers are declining due to deforestation, increased agriculture and cattle grazing, and continuing pressure from growing local populations. Woodland Park Zoo supports the Red Panda Network, whose multi-prong approach aims to conserve this flagship species in Nepal. 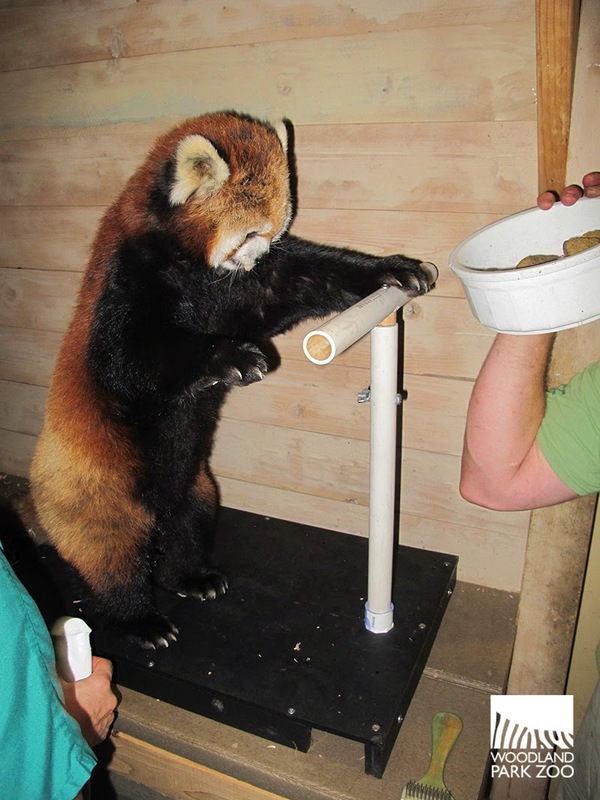 To help support the project, adopt a red panda through the zoo’s ZooParent Adoption Program. 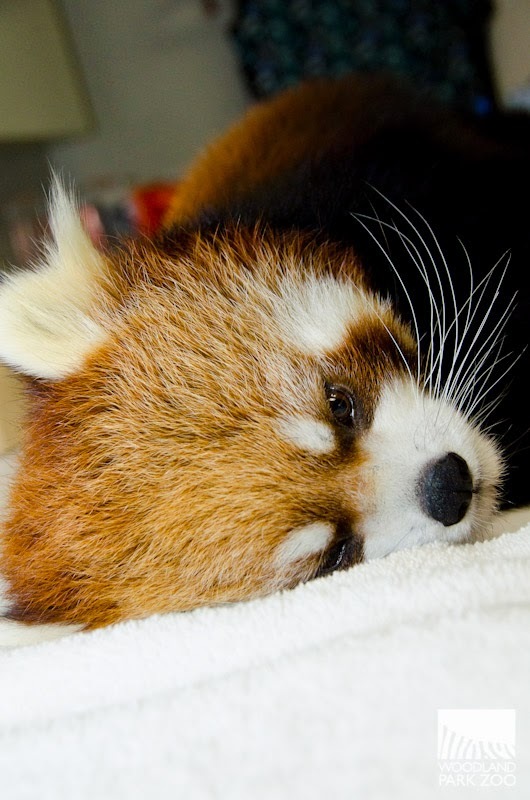 We'll keep you posted on any red panda developments! 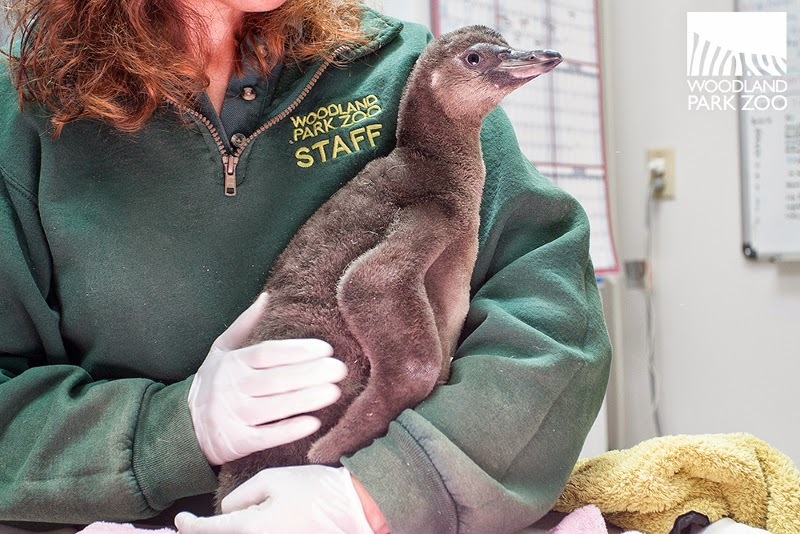 Woodland Park Zoo is deeply committed to providing excellent day-to-day care for our animals. In our efforts to continually raise the bar in animal welfare, WPZ has developed a robust and ever-evolving behavioral husbandry program. Recently, we were fortunate to bring nationally-recognized behavioral husbandry expert Marty MacPhee to Seattle to lead workshops and one-on-one sessions with our animal care and education staff. Marty has helped develop programs for Brookfield Zoo and Disney’s Animal Kingdom. She also helped design and taught the Association of Zoos and Aquariums (AZA) courses “Animal Training Applications in Zoos and Aquariums” and “Managing Animal Enrichment and Training Programs.” Many of our zookeepers and animal managers have already had the opportunity to complete these courses with more to enroll in the years to come. Marty MacPhee meets Marty the porcupine. Photo by Deanna Ramirez/Woodland Park Zoo. 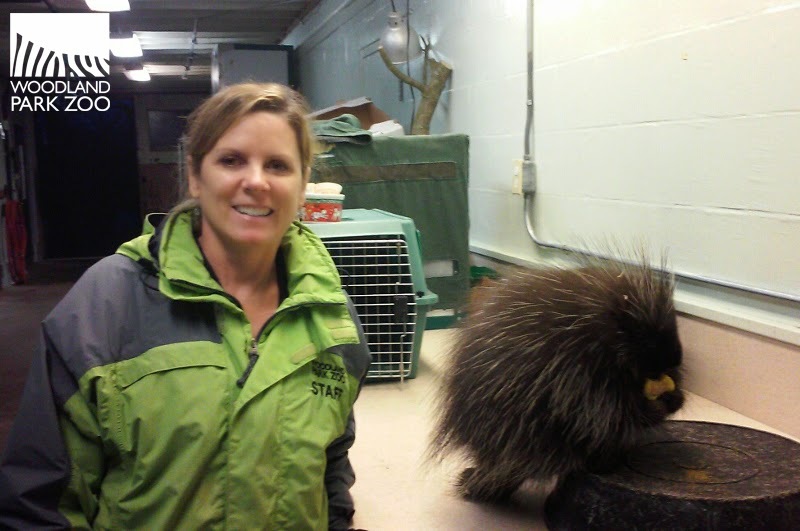 In fact, some of our keepers were so inspired by their experience in the AZA course, that they named our North American porcupine (born in April 2014) “Marty.” In the midst of her busy visit to WPZ, Marty the person found time to meet her namesake, Marty the porcupine. Who can forget how adorable Marty was when she was a newborn! Photo by Ryan Hawk/Woodland Park Zoo. Porcupine Marty currently lives off-exhibit at the Raptor Center. There she works one-on-one with her keepers who are training her for future appearances in raptor and education programs. Her training is coming along well—she is learning to go to her station and into her crate, as well as how to climb a ramp on command. It’s a little challenging for keepers to find a good time for training sessions with Marty, as she is nocturnal by nature, but the progress so far is promising! The Raptor Flight program is a great example of how the animals are encouraged to use their natural behaviors while working with zookeepers. Photo by Dennis Dow/Woodland Park Zoo. Behavioral husbandry is the science (and sometimes the art!) of promoting animal well-being by observing behaviors and subsequently improving care (husbandry) based on behavioral needs. Zookeepers observe the animals’ behavior and then provide enhancements to their environments with the goal of promoting natural behaviors. 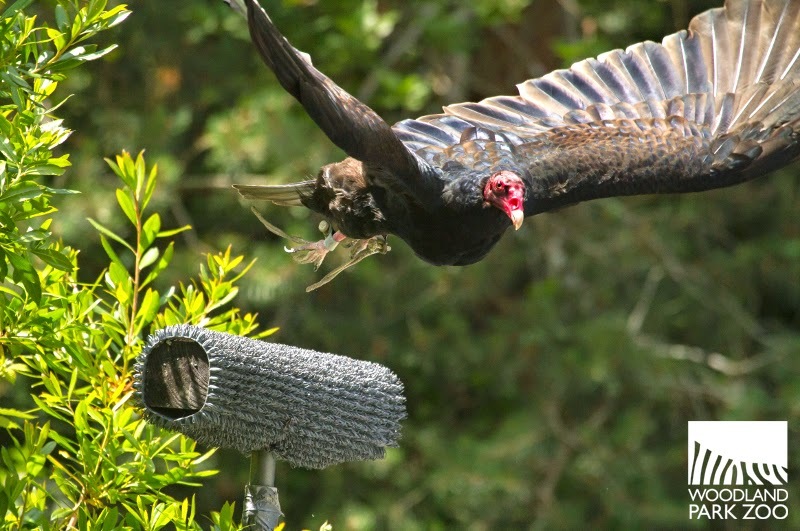 Two integral components of behavioral husbandry are environmental enrichment and training (or operant conditioning). Environmental enrichment at work: orangutans are natural climbers and move among tree tops, vines, and hammocks in the canopy of their exhibit. Photo by Dennis Dow/Woodland Park Zoo. The incorporation of environmental enrichment into the daily care of animals is a hallmark of AZA accredited zoos. AZA defines enrichment as a dynamic process for enhancing animal environments within the context of the animals’ behavioral biology and natural history. Environmental changes are made with the goal of increasing the animal’s behavioral choices and drawing out natural behaviors, thus enhancing their overall welfare. Enrichment comes in many forms: objects and toys, sensory stimulation to appeal to the animals’ sight, smell, touch, hearing and taste, or maintaining species-appropriate social groupings that resemble those in the wild. This encourages natural feeding, play, grooming and courtship behaviors. Through excellent training, silverback Leonel has learned to present his hands to keepers as part of treatment for dermatitis. Photo by Dennis Dow/Woodland Park Zoo. Training provides mental and physical stimulation and also allows animals to freely participate in their own care. For example, WPZ’s male gorilla Leonel has been trained to voluntarily present his hands so keepers can provide daily treatment for persistent dermatitis. This training program has resulted in dramatic improvement of his condition achieved with minimal stress to Leonel. Every day, WPZ’s animals are conditioned to offer trained behaviors that allow us to give them the best possible quality of life—from something as simple as stepping onto a scale to be weighed, to allowing medical procedures like blood draws and ultrasound exams, to complex routines such as raptor free-flight programs. 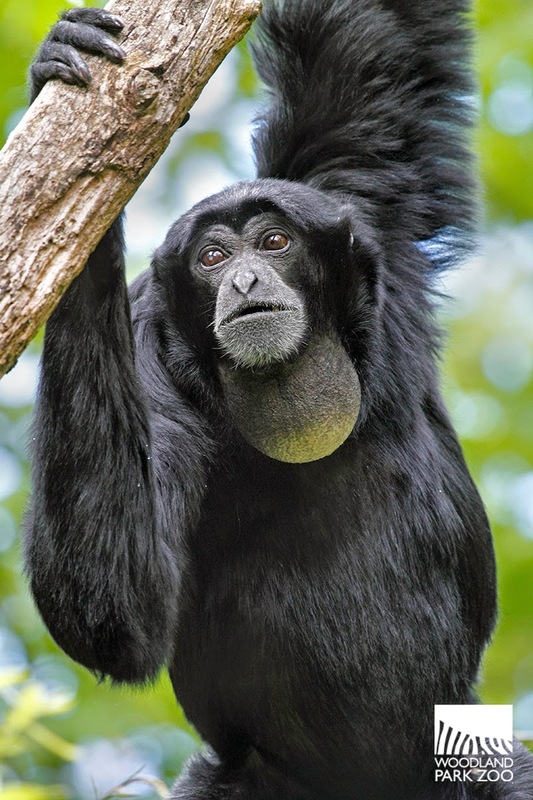 We have some sad news to share: Our long-time resident Simon the siamang was humanely euthanized yesterday, Monday, Dec. 15, after showing signs of declining health related to long-term chronic illness. Simon was 34 years old. Simon, photo by Dennis Dow, Woodland Park Zoo. Simon was hand raised until he moved to Woodland Park Zoo at 2 years old in 1982. He really enjoyed being around people and he quickly recognized faces he had seen before and liked interacting with them at the exhibit. A few regular visitors brought shiny objects to ‘share’ with Simon through the glass at his exhibit; they really connected with him and he was very inquisitive with them in return. Simon and Briony. Photo by Dennis Dow, Woodland Park Zoo. Simon lived in the Trail of Vines exhibit with his partner Briony, who came to Woodland Park Zoo nearly six years ago in need of a new partner after losing her mate. According to Martin, Simon hugged Briony within the first hour of their introduction and the pair had maintained a strong bond ever since. Simon and Briony drew large crowds to their exhibit a few times a day as they belted out their loud duet, which could last for about 15 minutes. “For more than three decades, Simon thrilled us every day singing from the treetops at earsplitting levels and swinging agilely from branch to branch. His song has come to an end and we, and surrounding neighborhoods who could hear the siamangs’ resonating duet, will deeply miss Simon” says Martin. 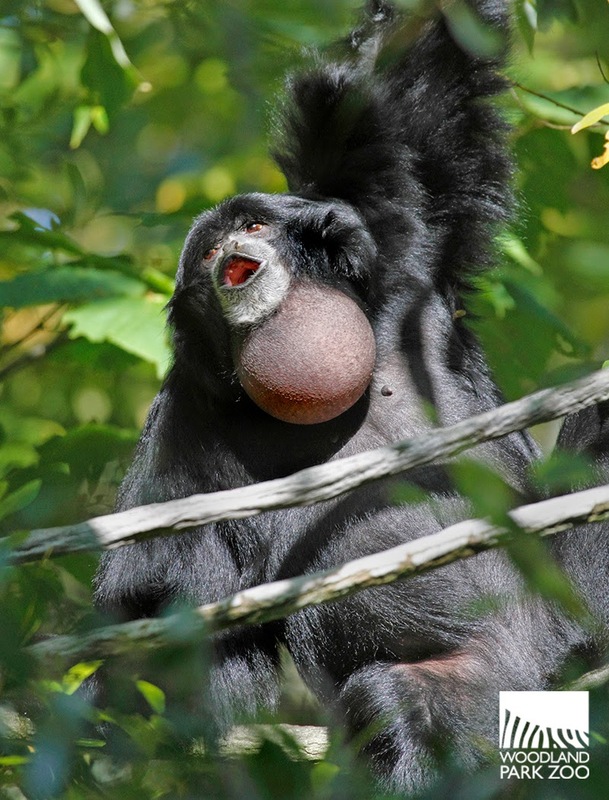 The zoo is now working with the Siamang Species Survival Plan for options for Briony and will be providing her with an accelerated enrichment program to help keep her stimulated and active as she adjusts to Simon’s departure. Simon at the Trail of Vines. Photo by Dennis Dow, Woodland Park Zoo. It is never easy losing an animal, no matter how much we prepare ourselves. Thanks to the dedication of Simon’s keepers and our veterinary staff, Simon lived a long, active, enriching life at Woodland Park Zoo. Wherever you are, please give a little howl, hoot or bark in honor of Simon! Simon, singing his little heart out in the treetops. Photo by Dennis Dow, Woodland Park Zoo. They may not be as well-known by the 180 million people who visit Association of Zoos and Aquariums (AZA)-accredited zoos and aquariums each year, but desert pupfish, freshwater mussels, and Polynesian tree snails play important roles in their respective ecosystems. If not for the hard work of AZA-accredited institutions and their conservation partners, some of these and many other animals would already have vanished from the planet. The 228 accredited members of AZA continue to build upon their history and expertise of saving endangered species such as breeding programs that coordinate across many institutions to ensure healthy genetic and demographic diversity and partnerships with local, national, and international conservation organizations working on the recovery of these species. Partula snail close up. Photo by Ryan Hawk/Woodland Park Zoo. Partula snails are tiny! Photo by Ryan Hawk/Woodland Park Zoo. 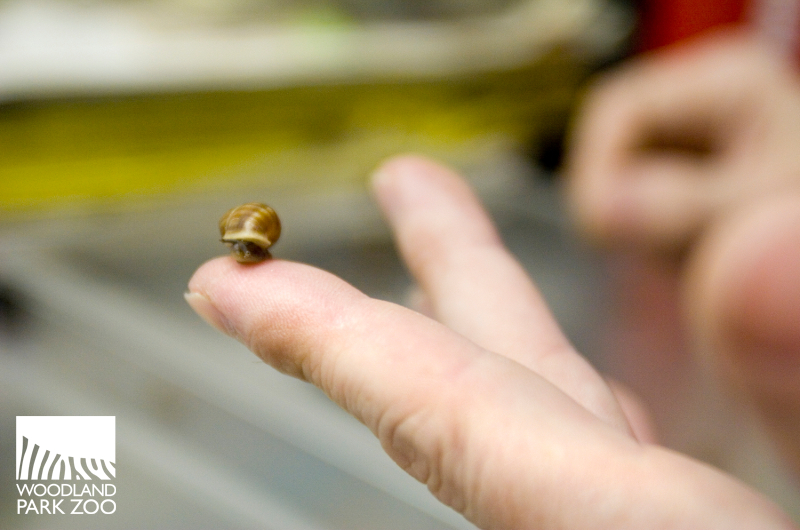 Woodland Park Zoo has a lab exclusively for the snails, which provides a special and secure space and optimal breeding conditions. 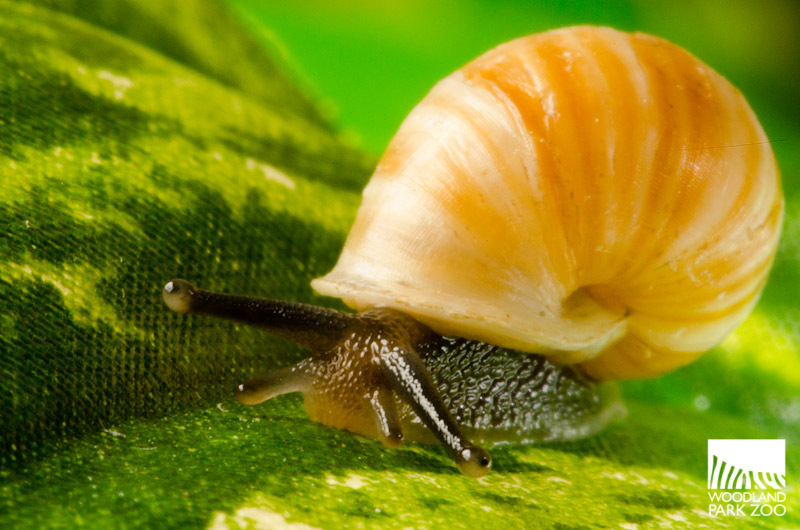 According to Sullivan, the population hovers at a little more than 900 snails at any given time. The lab is on view to zoo-goers. The Tree Snail Laboratory at Woodland Park Zoo. Photo by Kirsten Pisto/Woodland Park Zoo. Woodland Park Zoo currently partners with more than 35 field conservation projects taking place in the Pacific Northwest and around the world. Woodland Park Zoo supports the Partula Recovery and Reintroduction Project, whose goal is to preserve and enhance the survival of all surviving endemic tree snail species of the family partulidae within their natural range in French Polynesia, and to re-establish, where feasible, the 11 species that currently exist only in the international conservation breeding programs. Fish and mollusks are among some of the oldest groups of animals still alive today, pre-dating even the earliest insects. Despite hundreds of millions of years of evolutionary success, many of these species are vulnerable to a variety of threats, and their future is uncertain. AZA-accredited zoos and aquariums are doing everything they can to protect the most imperiled fish and mollusks from extinction. Northern riffleshell mussels. Photo courtesy of U.S. Fish and Wildlife Service. Found in the rivers and streams that traverse the North American continent, these bivalves are essentially living water filters, with some individuals capable of moving eight gallons of freshwater through their systems every single day. 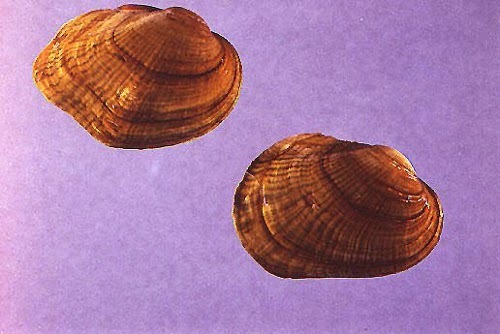 Freshwater mussels prevent buildups of algae and bacteria and are in turn preyed upon by animals such as fish and birds. Nearly 300 species live in the United States alone, many of which are threatened by pollution, damming, and competition from the invasive zebra mussel. Scientists at the Columbus Zoo and Aquarium have collaborated with local wildlife agencies to establish the Freshwater Mussel Conservation and Research Center (FMCRC), one of only 10 freshwater mussel conservation facilities in North America, to assist in the propagation and conservation of highly endangered freshwater mussel species. Over a five-year period alone, the Center reintroduced 6,200 endangered northern riffleshell mussels to Ohio waterways, the largest reintroduction ever to occur in Ohio. The riffleshell mussels are tagged with microchips so that they can be identified during annual surveys, and thus far the survival rate of reintroduced mussels has been extremely high. Desert pupfish. Photo by Andrew Borcher via Wikimedia. You wouldn’t think to look for fish in the desert, but this hardy species thrives in super-salty ponds and streams scattered throughout the American southwest. 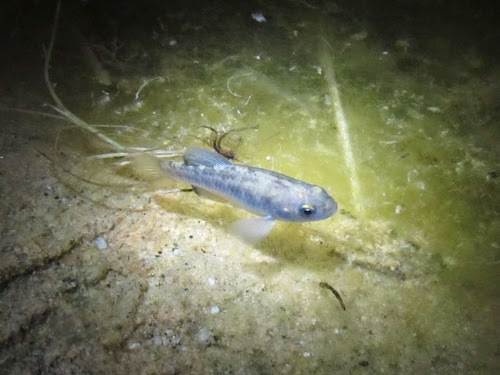 In fact, closely-related pupfish species found in isolated bodies of water offer evidence that a series of prehistoric desert lakes were once connected. These days, the desert pupfish is threatened by human developments and invasive species that compete for the precious little aquatic habitat that remains. Under the leadership of Phoenix Zoo and The Living Desert, the desert pupfish is being bred in captivity and released into protected areas so that it can carry on the story of the desert’s history. With their abilities to live in some of the most extreme desert environments, these fish demonstrate the incredible range of adaptations found in healthy ecosystems. Up close detail of Partula tree snail. Photo by Ryan Hawk/Woodland Park Zoo. Considered among the smallest of all endangered species, this species of partula snail is already extinct in the wild and would be gone completely were it not for the work of AZA-accredited zoos (Akron Zoo, Detroit Zoo, Disney's Animal Kingdom, Saint Louis Zoo, and Woodland Park Zoo) and international partners that are breeding these snails for reintroduction in their native range in the South Pacific. 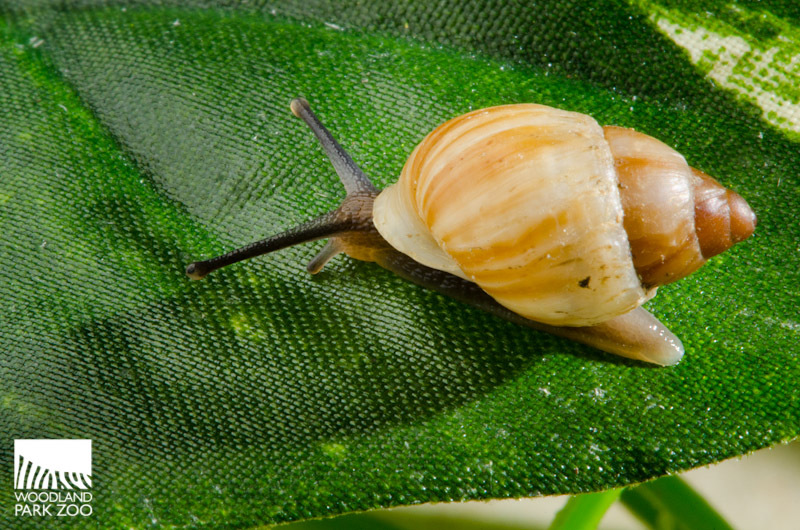 Like so many other mollusks, the Polynesian tree snail declined from the introduction of an invasive species—in this case, a predatory snail that was introduced to control the population of yet another introduced snail. These snails were first described from specimens collected by the British explorer Captain James Cook, have been the subject of extensive field and laboratory research, are prominent in Polynesia’s cultural history, and play important roles in nutrient recycling and in the food chain of their native ecosystem. For a list of AZA-accredited zoos and aquariums where you can see some of these incredible animals in person, visit http://www.aza.org/SpeciesBeingSaved. The ZooCrew middle school outreach program is back in action this fall at Asa Mercer International Middle School, Washington Middle School, Seattle World School, and McClure Middle School. This quarter, ZooCrew participants learned about issues facing the animals of the African savanna. The participants designed their own projects to take action on these issues, raising awareness and advocating for the animals. Check out some of the projects from this quarter! Waterhole Restoration Project: bringing awareness to issues around waterholes in the African savanna and highlighting a resource for people to learn more about the issues and projects happening. Video created by Ava, Isobel, Tracey, Malia. Michael from Seattle World School chose to write about the Waterhole Restoration Project and bring awareness to the issue of resource depletion and how it affects animals. In his blog post, he explains what people can do to get involved with helping local conservation efforts. Read Michael's blog. 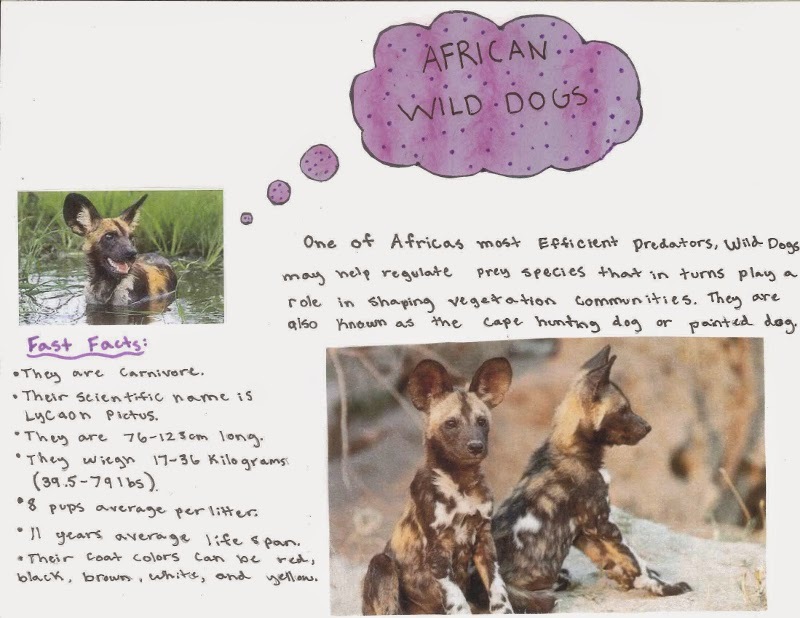 African Wild Dog Project: educating people about the most endangered carnivore in the African savanna and encouraging people to take action and help. The posters, created by Raegan, Maya, Michelle, and Julia from Asa Mercer International Middle School, will be displayed at their school to inform and inspire their peers. 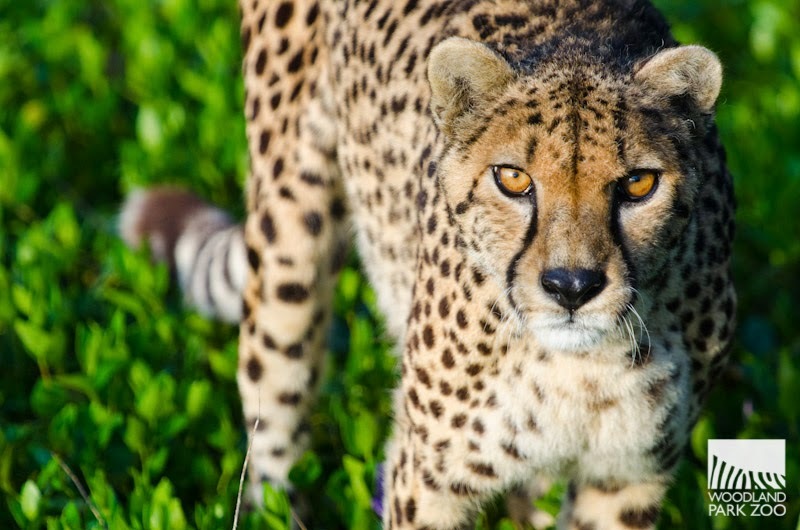 Cheetah Project: educating people about the cheetah. 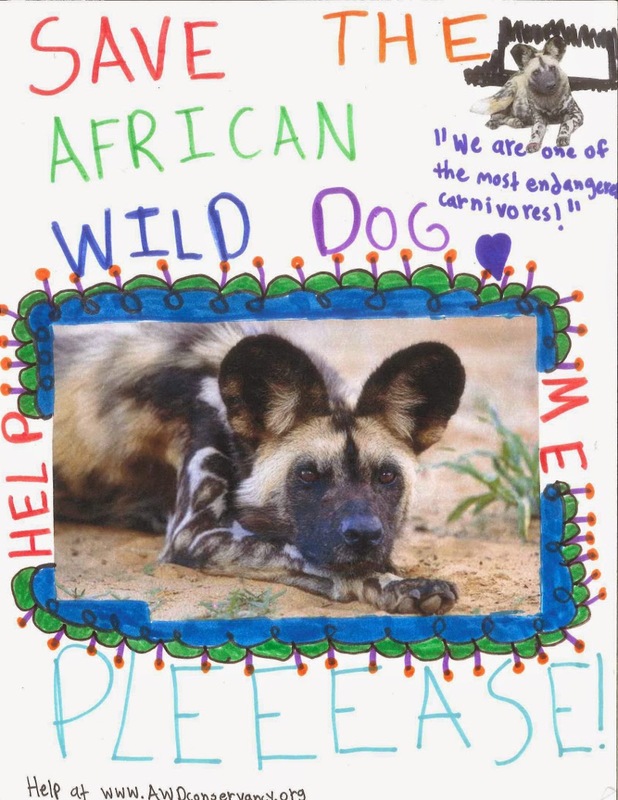 Tommy and his team from Washington Middle School created a poster to teach others about the cheetah. Not only was their poster displayed at the ZooCrew Conservation Project Showcase, but it was also displayed at their school during a special evening event for students and their families. 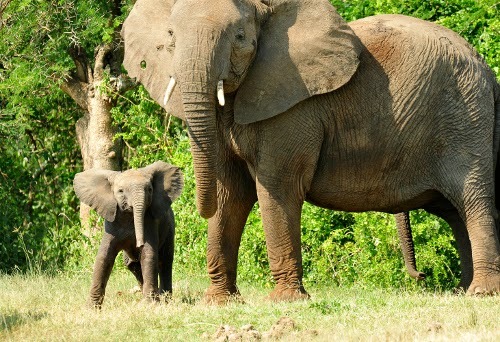 Elephant Poaching Project: raising awareness and educating people about threats to African elephants. Mahalia, Rowan, Ayden, Jasmyne, Isabella, Nasia, Milla, and Joanne from Washington Middle School set out to educate others and spread awareness about issues in the African Savanna. 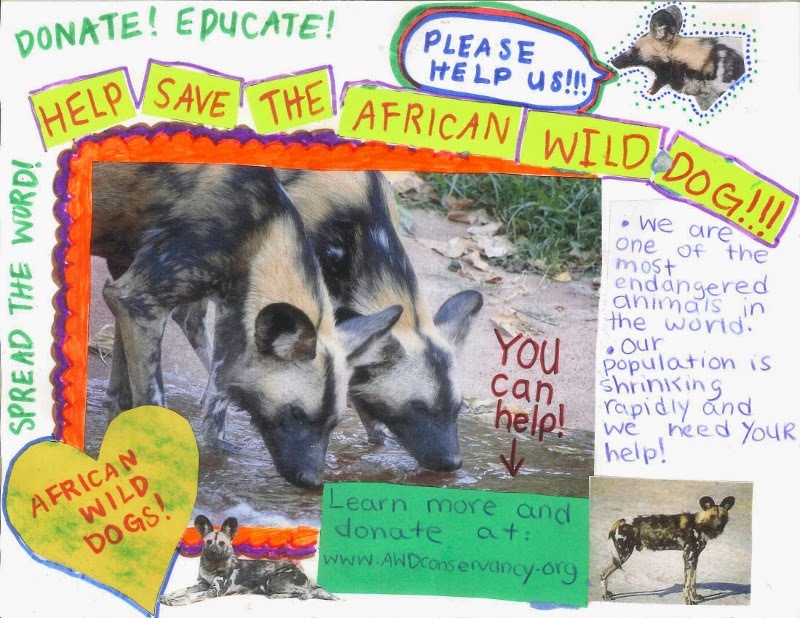 They hoped that through their poster making campaigns, they would inspire others to take action to save endangered animals like the African elephant. Cheyenne and Ann from Washington Middle School are also passionate about saving African elephants. They hoped to educate people about them by writing a blog post for others to read. Lion Education Project: raising awareness about conservation issues that affect lions and inspiring action. Siblings Strella and Stelbee from Seattle World School shared their passion for lions by writing two informational blog posts about lions. 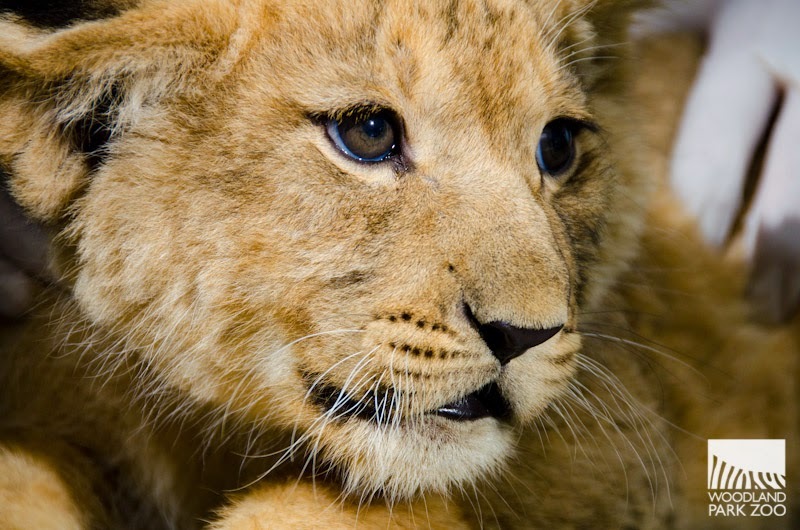 They hope to inspire others to care about lions and take action. Read Strella’s blog post and read Strelbee’s blog post. 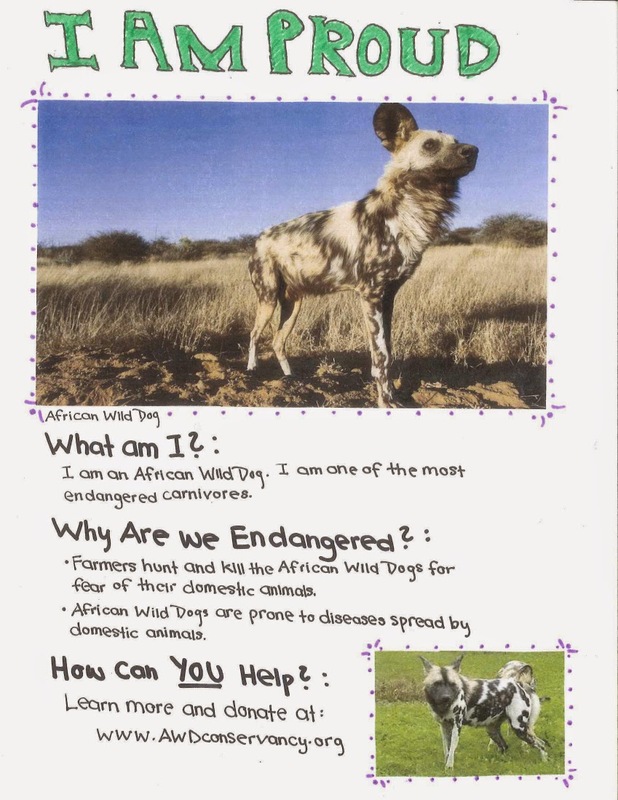 Nawaal and Hui from Seattle World School took a different approach to raising awareness about issues facing animals in the African savanna. Both wrote narratives about how lions and humans coexist in the African savanna. Read Nawaal’s blog post and read Hui’s blog post. These were just some of the many projects ZooCrew students worked on during the fall. Congratulations to the ZooCrew participants on a job well done! Learn more about Woodland Park Zoo's conservation work in Africa and around the world through our field conservation program. Attention TGIFers: Here is your update on the most adorable trio in Seattle. 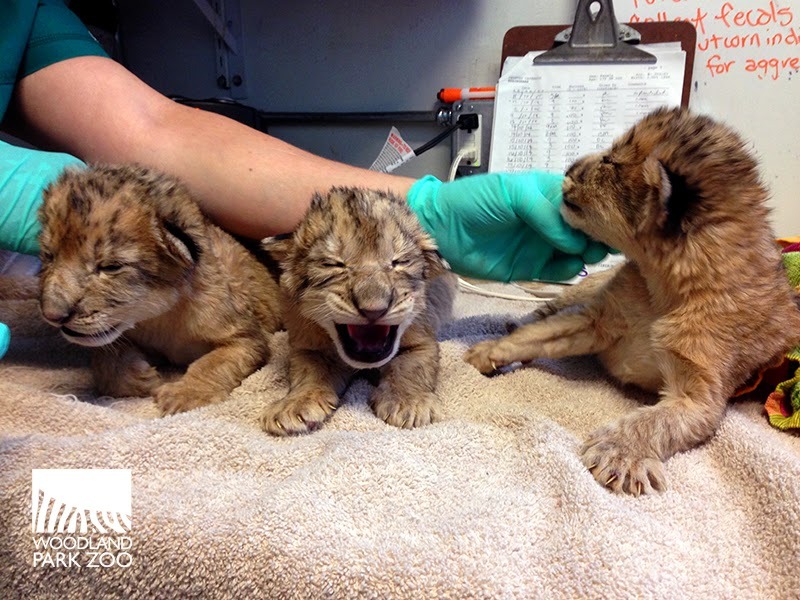 Our wriggly little lion cubs aced their 6-week exams this morning. 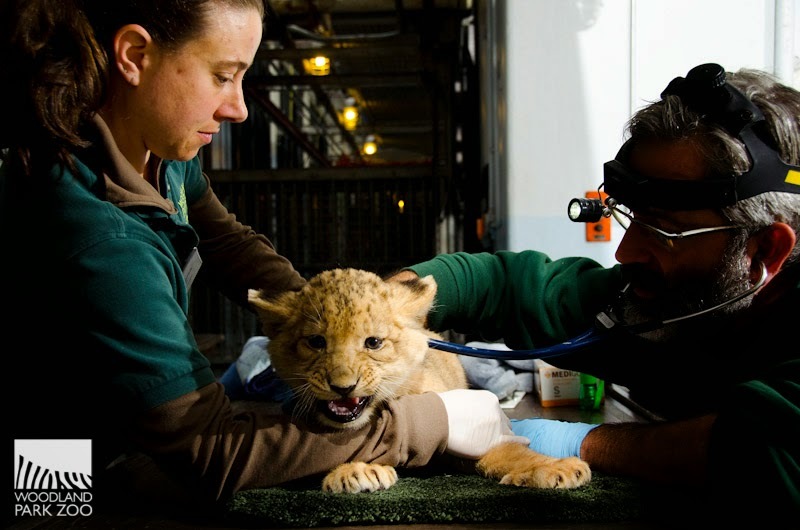 Zoo veterinarians gave the energetic cublets a clean bill of health and good marks on their growth milestones. The routine wellness exam included blood draws, vaccinations, weigh-ins and an overall health assessment for the three boys. The cubs were a bit suspicious of the stethoscope, but all in all they were very calm during their exam. Photo by Ryan Hawk, Woodland Park Zoo. Throughout the exam the cubs were pretty quiet with a few occasional little growls. Their keepers were by their side at all times to reassure them. Photo by Ryan Hawk, Woodland Park Zoo. The cubs currently weigh between 15 and 17 pounds, which means they are getting plenty of mom’s milk and are growing quickly. The smallest cub is also the feistiest, just in case you were curious. At this stage, the cubs’ fur is quite downy. As they grow, their under-fur will become thinner and their coat will become a bit more course. Photo by Ryan Hawk, Woodland Park Zoo. This video shows a quick recap of the exam including a very loud little patient. Video by Kirsten Pisto, Woodland Park Zoo. 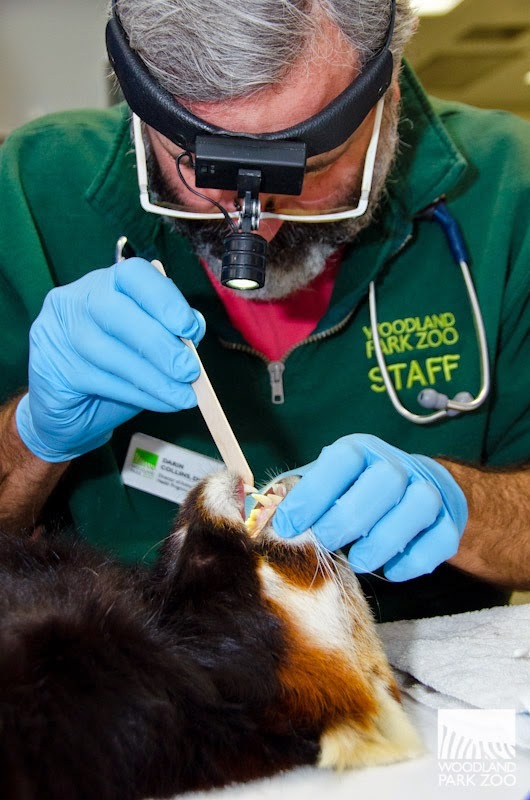 The keepers work closely with vet staff to ensure a quick and smooth exam. 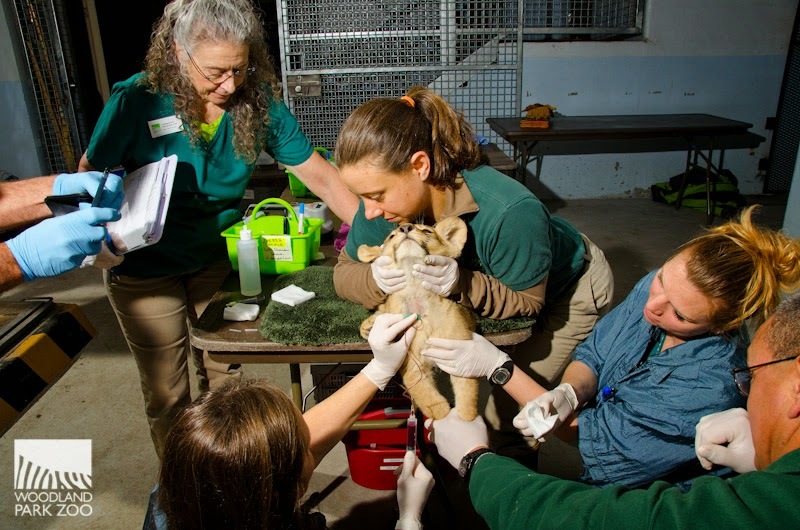 Here the vet techs draw a bit of blood while keeper Christine soothes the cub. Photo by Ryan Hawk, Woodland Park Zoo. Martin tells us that Dad Xerxes currently has limited access to his cubs, but he continues to show positive signs that he wants to bond. “We are drafting a plan for introducing Xerxes to his cubs and are confident that he will join Adia in the parenting role of teaching them how to be lions and roughhousing,” said Ramirez. 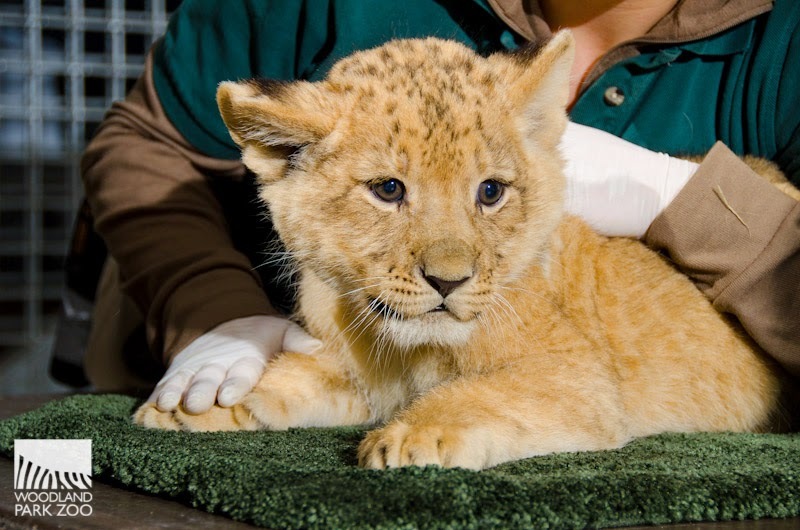 The cubs, born October 24, 2014 are now important ambassadors in the lion species survival program. Xerxes arrived in the spring from El Paso Zoo to be paired with Adia under a breeding recommendation by the Species Survival Plan (SSP) for African lions. 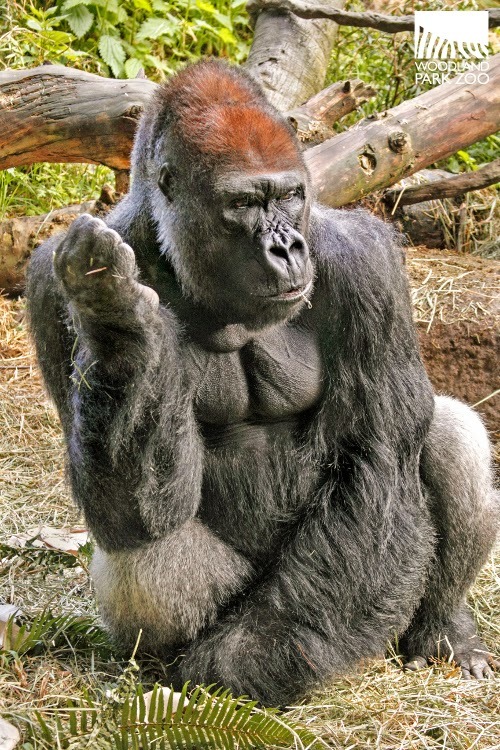 Adia arrived in 2010 from Columbus Zoo and Aquarium, in Ohio. SSPs are a complex system that matches animals in North American zoos based on genetic diversity and demographic stability. Woodland Park Zoo supports the Ruaha Carnivore Project, which focuses on the importance of predators to healthy ecosystems, through the Lion Species Survival Plan Conservation Campaign. To help support the project, adopt a lion through the zoo’s ZooParent Adoption Program: www.zoo.org/zooparent/lion.